As the colder weather sets in, my skin tends to get a little dry so now is the perfect time for me to experiment and try out different lotions and potions! 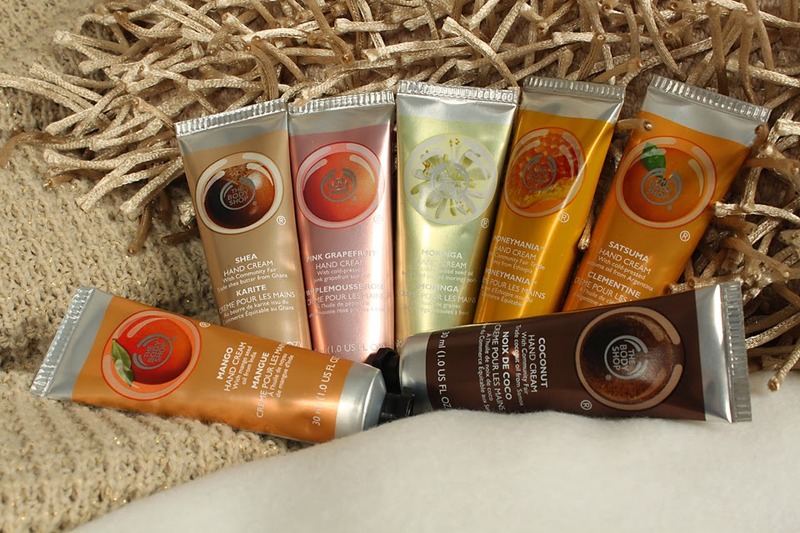 These hand lotions were part of a mini haul from the Body Shop a few weeks ago. I had a great deal on the items I purchased, and I did notice today that they have a £25 discount on any spend of £50 so if you want to pick any of these up, now would be the perfect time! I also received these Absinthe scents as free gifts. I love the design of the packaging but the only thing that bothers me is that it's already looking a little hammered after just being used around the house. I'm a little worried about the state it will be in when I've thrown it in my bag. My fingers are crossed that they will survive and not end up bending and bursting. 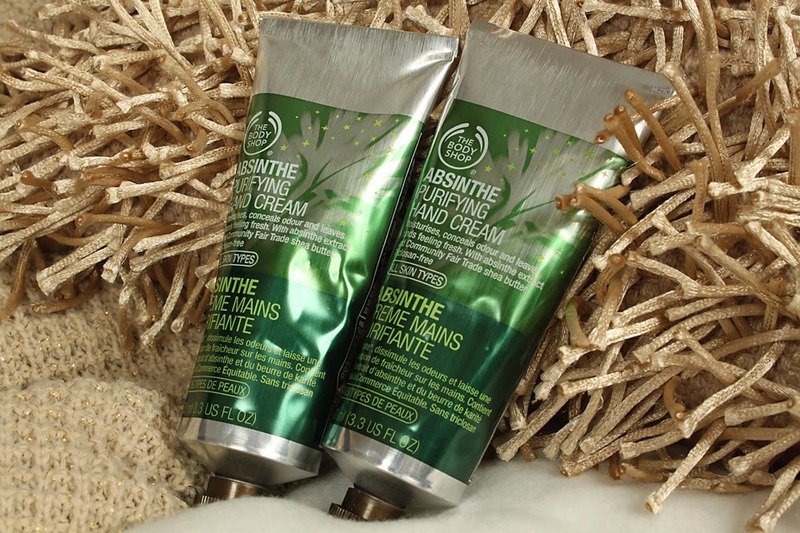 The first tube I opened was one of the freebies, the absinthe purifying hand cream. 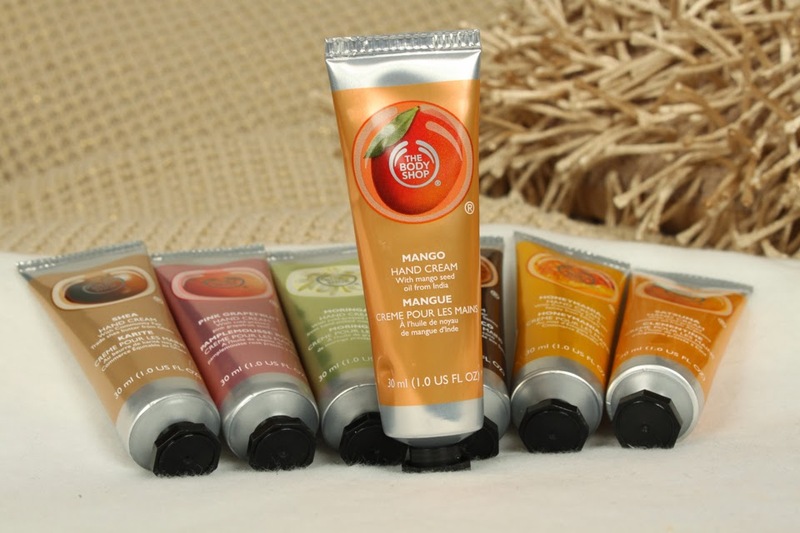 The packaging says that it "Moisturizes, conceals odour and leaves hands feeling fresh. With abinthe extract and community fair trade shea butter. 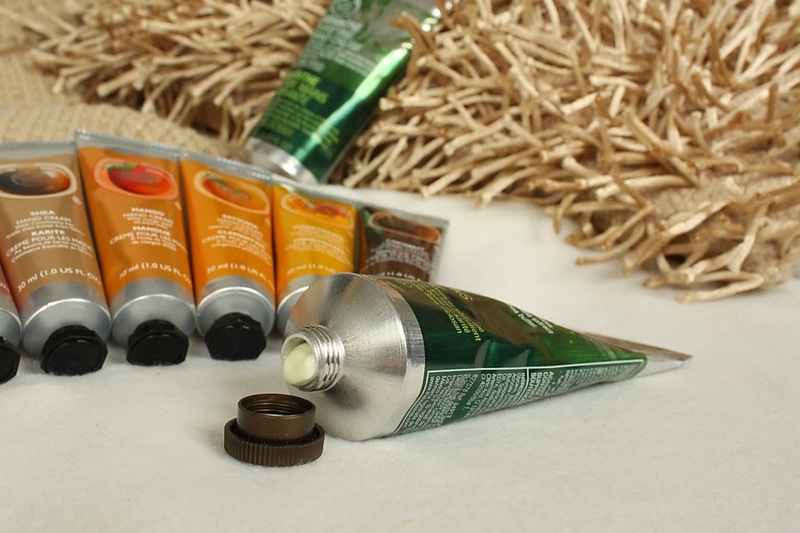 Triclosan-free"
I opened up the tube for a sniff and whilst I wasn't so keen on the scent, I love the fact it conceals odour! As weird as that sounds, it's the perfect hand cream to pop next to the sink. When I cut onions or garlic, I hate the fact I can't get rid of the scent from my hands for days, no matter how many times I was them. I tried this hand cream out and it definitely worked at concealing the odour, so it's become a must have for my kitchen. Then I moved on to the smaller tubes I purchased. They're each 30ml and perfect to throw in my handbag or have on my bedside table if I find my hands feeling dry throughout these colder months. 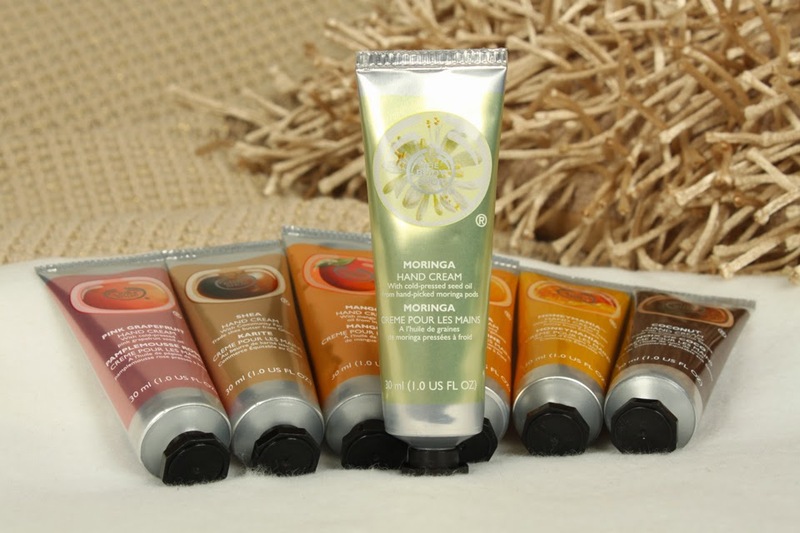 This moringa hand cream contains cold-pressed seed oil from moringa pods. I must confess, I had no idea what a moringa was, let alone that it had pods, so I headed over to google to do a little search on this plant. I found that the Moringa has a bunch of health benefits. The moringa plant itself can cure headaches, stop bleeding from shallow cuts, treat fevers from bronchitis, eye and ear infections. It has anti-bacterial and anti-inflammatory effect when applied to wounds or insect bites. To top it all off, it smells floral. Totally reminds me of a meadow! The cream itself is very moisturising and not at all oily. It absorbs straight in to your skin, which is definitely a plus for me. I hate greasy lotions that refuse to sink in to my skin, so I have to avoid doing anything for a good 15-20 minutes whilst it does its job. 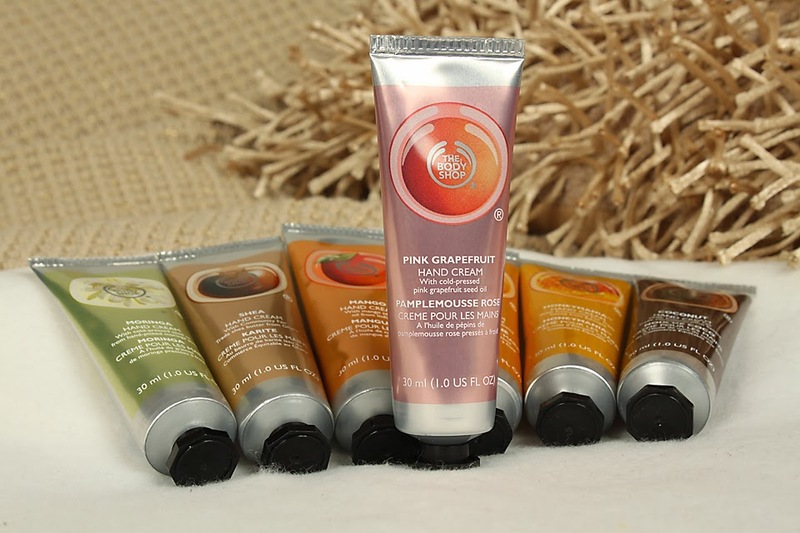 Then I moved on to check out the pink grapefruit hand cream. This one is made with cold-pressed pink grapefruit seed oil. I have tried eating pink grapefruits on a number of occasions but it's way too sour for me. I learnt that the seed oil contained in this hand lotion provides a bunch of essential fatty acids which help repair your skins moisture barrier. Again this one absorbs straight into my skin, which I love. It totally smells of grapefruit. The scent made me pull a face like "omg it's sour" but it's not over powering once it's on your skin which is great. I'm obsessed with the scent of shea butter so I knew this would be getting a thumbs up from me. Like all of the others, it sinks straight into your skin. It smells ever so slightly of nuts, but totally reminds me of holidays! The next one I tested out was this coconut hand cream. Now I was a little dubious when it came to adding this to my shopping cart. It's a long story but I feel I need to fill you in before I proceed with this review. I had a friend at school who would lather herself in body shop coconut products and although I love coconut, everything coconut scented totally reminds me of her (somebody I'd rather not be reminded of), so naturally this scent isn't for me, however that isn't anything to do with the product itself, just personal preference. It does sink in to your hands really quickly and totally smells exactly like coconut. So if that's something you like, it would be a great purchase for you. Now to the scent I was most excited about, honeymania. I hadn't been into the body shop in a while so never actually smelt this product before, but I love honey so figured I'd give it a try! I was a little disappointed by the scent as it totally doesn't smell of honey, rather a bunch of flowers. It is quite nice though, just not the smell I was expecting as I lathered my hands in it. Who doesn't like mango? This is another scent that reminds me of holidays. 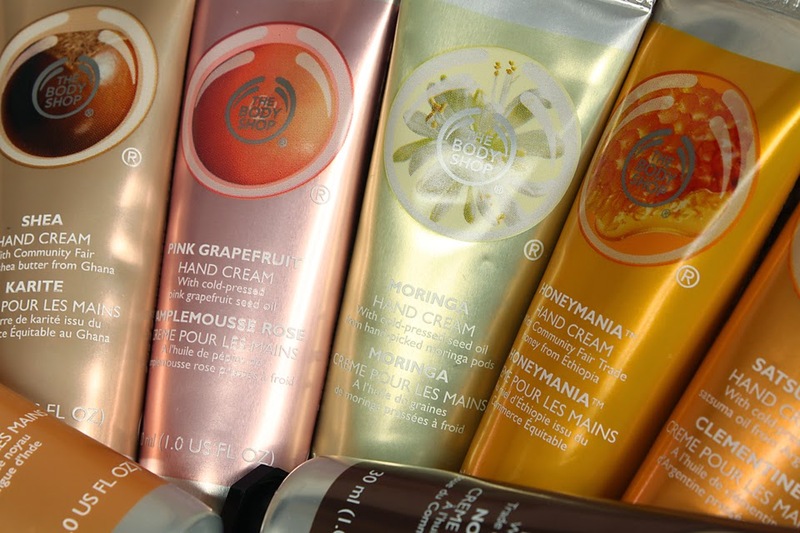 You're probably wondering what on earth I do on holidays smelling of all of these hand creams, lol! It's very light but smells like a juicy mango, yum. 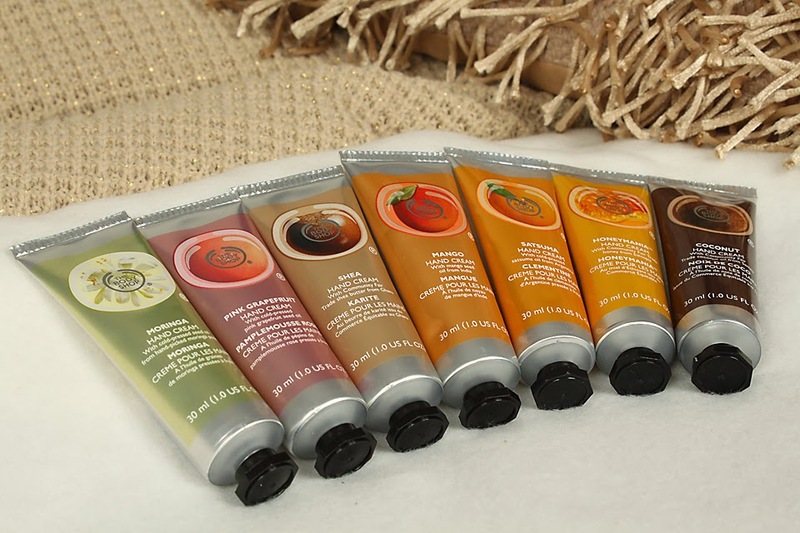 Another hand cream that absorbs instantly and is totally not greasy. Amazing! The body shop's satsuma hand cream totally made my hands smell like I'd just peeled a satsuma. Only wish I'd eaten it too! If you're not the kind of person who likes the smell of oranges/ tangerines/ satsumas on your hands once you've peeled them, this scent probably isn't for you. I however, love it. Now I'm really craving a satsuma though, damn you body shop! Overall, I'm really pleased with my purchases. I already have a few of these added to my shopping cart right now, to give as Christmas stocking fillers this year. I would highly recommend checking these out. They are worth every penny simply for the non-greasy formula that absorbs so quickly into your hands. I now have absolutely no excuse for having dry hands this winter. Mmmm. My hands need a bit of help in these colder months too.